Craftin' Caro: Sale-A-Bration means FREE stuff, until March 31! 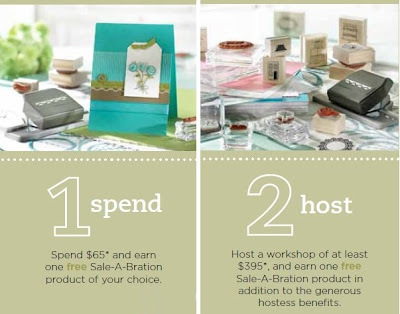 Sale-A-Bration means FREE stuff, until March 31! There's still time for you to take advantage of Stampin' Up! 's biggest sale of the year: Sale-A-Bration! And NEW for 2010, here are all the OTHER sets that can be redeemed for Sale-A-Bration rewards as well! To make things even more wonderful, it coincides with the arrival of a FABULOUS new Mini Catalogue, the Occasions Mini (and don't forget my new free tutorial! ).